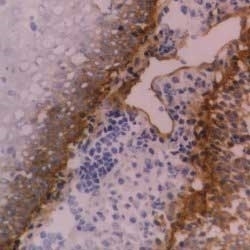 Staining of human tonsil cryostat section with Mouse anti human CD104 antibody, clone 450-9D (MCA1456). Mouse anti Human CD104 antibody, clone 450-9D (MCA1456) showing β4 integrin expression in reconstructed hemicorneal section by immunofluorescence. Expression of epithelial cell markers in reconstructed hemicorneas. Human corneal epithelial stem cells seeded onto the HKL scaffold form a pluristratified and differentiated epithelium. Cryosections were analyzed through immunofluorescence. The layer of basal cuboidal cells was firmly attached to the underlying extra cellular matrix (ECM) and to the basement membrane through integrins α6 (blue, A), β1 (green, B), and β4 (red, C). The basal expression of p63 isoforms (red, D) and of the stem cell marker ΔNp63α (yellow, E) was always observed, thus suggesting the maintenance of undifferentiated progenitor cells interspersed between differentiated cells. Expression of keratin 14 (green, F) was also observed in the basal layers. Corneal differentiation occurred in all epithelial layers and was evaluated through the analysis of several markers, including 14-3-3σ (pink, G), keratin 19 (orange, H), keratin 3 (yellow, I), and keratin 12 (red, J). Note the presence of the Bowman's membrane in transmitted-light images (white arrows, D–E). Scale bar=50 μm. From: Barbaro V, Ferrari S, Fasolo A, Ponzin D, Di Iorio E.
Reconstruction of a human hemicornea through natural scaffolds compatible with the growth of corneal epithelial stem cells and stromal keratocytes. Mol Vis. 2009 Oct 17;15:2084-93. Mouse anti Human CD104 antibody, clone 450-9D recognizes the human beta4 integrin, also known as CD104. CD104 is a ~205 kDa glycoprotein which associates with the alpha6 integrin to form the alpha6/beta4 complex. CD104 is expressed on epithelial cells, Schwann cells and various tumor cell lines. Mouse anti Human CD104 antibody, clone 450-9D recognizes an extracellular epitope on the CD104 molecule. Purified alpha6 beta4 integrin from A431 cells. Kennel, S.J. et al. (1990) Second generation monoclonal antibodies to the human integrin alpha 6 beta 4. Barbaro, V. et al. 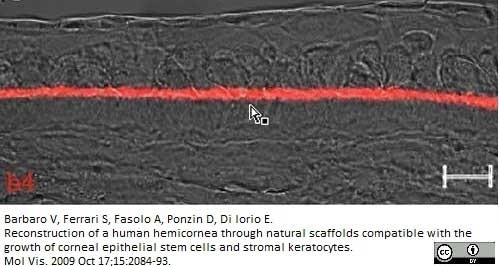 (2009) Reconstruction of a human hemicornea through natural scaffolds compatible with the growth of corneal epithelial stem cells and stromal keratocytes. Alam, H. et al. (2011) Loss of keratins 8 and 18 leads to alterations in α6β4-integrin-mediated signalling and decreased neoplastic progression in an oral-tumour-derived cell line. J Cell Sci. 124: 2096-106. Lai-cheong, J.E. et al. (2009) Loss-of-function FERMT1 mutations in kindler syndrome implicate a role for fermitin family homolog-1 in integrin activation. Am J Pathol. 175 (4): 1431-41. Groves, R.W. et al. (2010) A homozygous nonsense mutation within the dystonin gene coding for the coiled-coil domain of the epithelial isoform of BPAG1 underlies a new subtype of autosomal recessive epidermolysis bullosa simplex. J Invest Dermatol. 130 (6): 1551-7.